"Spectroscopic characterization of vacuum ultraviolet free electron laser pulses"
Fig. 1: Schematic presentation of the above threshold ionization (ATI) process giving rise to the sidebands in the photoelectron spectrum. Sidebands (SB) occur only at spatial and temporal overlap of the FEL and the optical fs-pulses. Fig. 2: Part of the photoelectron spectrum for the two-photon ionization of helium atoms by the xuv radiation from the FEL. The sidebands created by the additional optical dressing field are observed to the right of the main He 1s-1 line. Different spectra are given as a function of the time delay between the FLASH pulses (< 50 fs, 32.2 nm) and the optical (12 ps, 523 nm, 250 μJ) laser. A theoretical spectrum for optimal overlap of the pulses is shown for comparison. Fig. 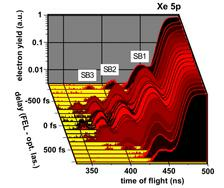 3: Part of the photoelectron spectrum for the two-photon ionization of Xenon atoms by the xuv radiation from the FEL. Different spectra are given as a function of the time delay between the FLASH pulses (20 fs, 13.8 nm) and the optical (120 fs, 800 nm, 20 μJ) laser. The Free electron LASer in Hamburg (FLASH) is a unique source for intense, ultra-short extreme-uv (xuv) light pulses. In view of these unprecedented characteristics, an associated time-synchronized optical laser facility opens up new and particularly exciting research opportunities. First characterization of this pump-probe set-up was obtained recently via time-dependent two-photon experiments on rare gases. The process of above threshold ionization (ATI), which is very sensitive to the spatial and temporal overlap of both pulses, was used to demonstrate the capability and the stability of the combined application of two independent femtosecond laser sources, namely the XUV free electron laser and the synchronized optical laser. The operation of FLASH, beginning in mid-2005 represents a unique synergy of optical and accelerator technologies producing ultra-short laser pulses at high fundamental photon energies with high peak and average power. A complementary optical laser facility has been set up at FLASH which provides femtosecond infra-red (120 fs, 800 nm) and picosecond visible (12 ps, 523 nm) pulses, electronically synchronized with the xuv pulses. To achieve the maximum time resolution for pump-probe experiments, the synchronization of the optical laser pulses to the FEL pulses (10-50 fs) should be on the timescale of the pulse duration itself, i.e. 120fs or shorter. A powerful tool to obtain information about the temporal overlap of femtosecond pulses is given by the above threshold ionization (ATI) process (Fig. 1). In brief, this technique uses electron spectroscopy of rare gas atoms to analyze the photoionization signal produced by a xuv photon in the presence of a strong optical laser beam. The intense optical field dresses the photo-ejected electrons, in other words, the electrons are born into the optical field and can emit or absorb one or more additional light quanta, which are observed as a sideband structure on both sides of the main atomic line in the photoelectron spectrum [1,2]. Since the effect depends strongly on the strength of the optical field, the intensity of the sidebands is a direct measure of the time delay between both laser pulses. First experiments have been performed using the picosecond optical laser in combination with femtosecond VUV pulses from FLASH operating at 32.2 nm . The relatively large temporal width of the optical laser reduces greatly the restrictions of temporal overlap between both pulses and makes the experiment less sensitive to the temporal jitter of the FEL. A typical set of photoelectron spectra, showing the region close to the helium 1s-1 main line and the high-energy sideband, is displayed in Fig. 2. For different values of the temporal delay between the xuv and the visible light pulses the growth and decay of the sidebands is clearly demonstrated. The experimental data shown were interpreted in terms of a theoretical analysis performed by numerically solving the time-dependent Schrödinger equation (TDSE) for a single active-electron, three-dimensional model of helium . The relative magnitude of the right-hand sideband, as compared to the main peak, is found to be 1.95%, in very good agreement with the experimental results for the best overlap between the two fields. The temporal region where both pulses overlap, i.e. the width of the cross correlation signal, is determined to 12.0±0.4 ps, which is, as expected, almost completely related to the width of the optical laser. A much more precise measurement, in particular a direct determination of the temporal jitter, is obtained when the femtosecond optical laser is used in combination with the FLASH pulses. In a continuation of the above experiment the ATI signal of the 5p photoionization of Xe atoms was measured (Fig. 3). The higher field of the optical fs- laser gives rise to a more pronounced sideband structure, in particular higher sidebands caused by the absorption of up to four optical photons are observed. The sidebands are observed only in a reduced temporal region of ~ 600 fs. This width is now mainly determined by the temporal jitter of FEL pulses with respect to the optical laser and represents the overall temporal resolution (~250 fs rms), which can be obtained for any pump-probe experiment without further characterization of the relative temporal delay between both pulses. The present results illustrate the successful combination of the two very different laser types and clearly show the potential of short wavelength SASE FEL–optical laser pump-probe experiments at FLASH. Comparison of the single-shot sideband intensities with the TDSE from above makes it possible to determine the relative temporal delay with an accuracy of better than 50 fs. These new data are currently submitted for publication . J. M. Schins et al., Phys. Rev. Lett., 73, 2180 (1994). T. E. Glover et al., Phys. Rev. Lett., 76, 2468 (1996). M. Meyer et al., Phys. Rev. A 74, 011401(R) (2006). R. Taieb et al., Phys. Rev. A 62, 013402 (2000).